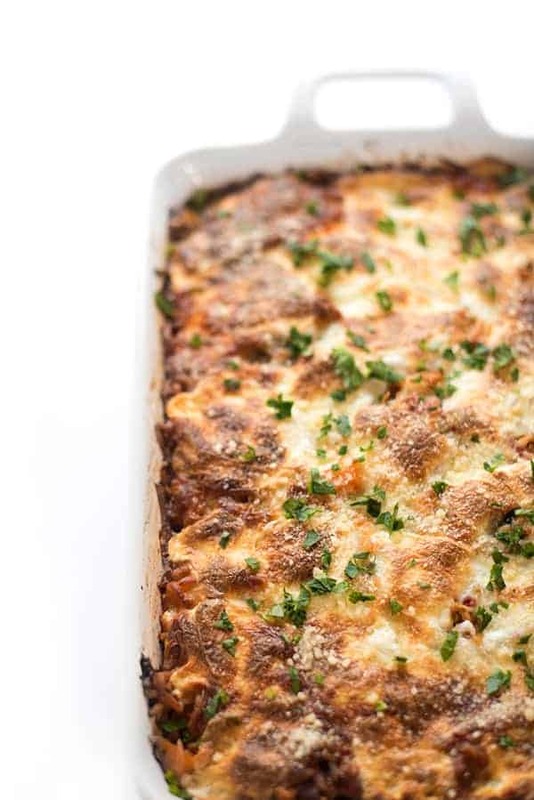 This hearty and comforting fall casserole is made with nutty farro, Italian sausage, creamy butternut squash and two types of mozzarella cheese. This post is created with America’s Dairy Farm Families and Importers, in partnership with the Innovation Center for U.S. Dairy, however the views and opinions included are my own. Winter is right around the corner but if I’m being honest, it has felt like winter for several weeks here in Michigan. Am I bummed about it? Not at all – bring on the hearty soups, warm fires, wool sweaters and cozy comfort food! 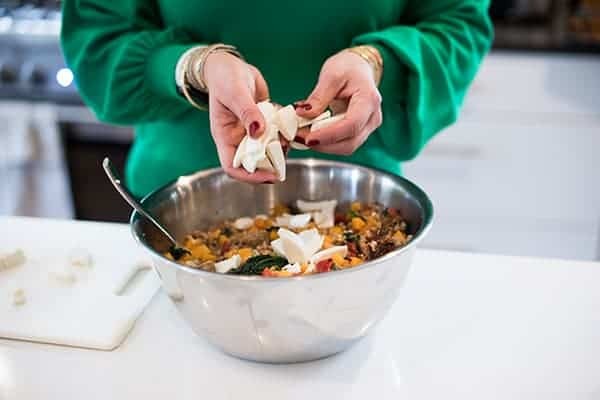 In case you still need a little convincing to celebrate the season, I’m hoping this flavor-packed Italian Sausage and Butternut Squash Farro Bake does the trick. 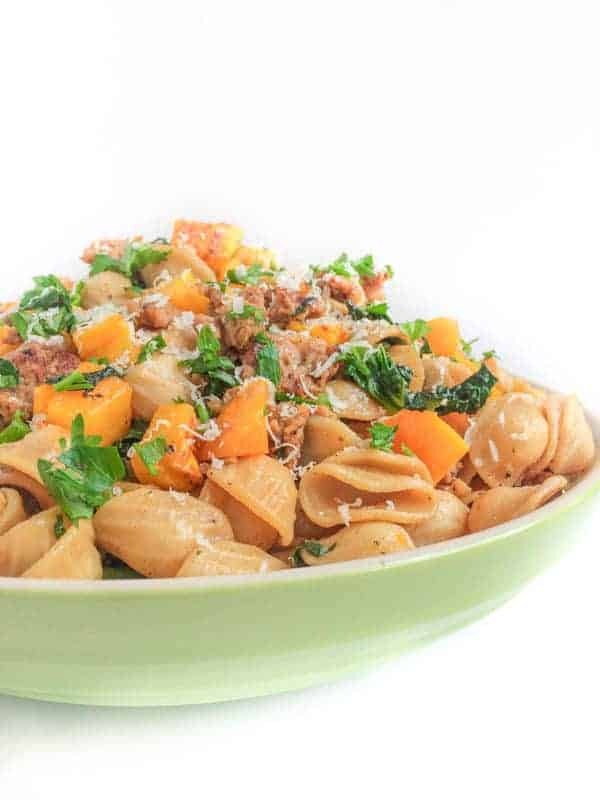 Filled with chewy, whole grain farro, creamy butternut squash, large chunks of Italian sausage and several types of gooey cheese, this one-pot dish will become a regular in your meal rotation. 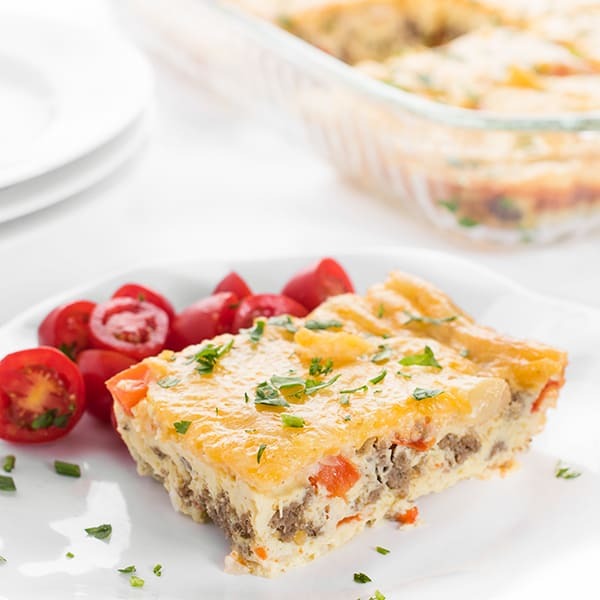 While traditional casseroles are often lacking nutrients, I decided to revamp a classic by adding different wholesome ingredients that result in a well-balanced dinner. For example, instead of using enriched white pasta as a base, I use farro, an ancient whole grain. Two types of mozzarella cheese provide protein and other important vitamins and minerals that help fuel the body and contribute to a well-balanced diet. These fresh, wholesome products aren’t hard to find—they’re right down the dairy aisle. Butternut squash adds even more nutrients to the dish including Vitamins C and E, folate and niacin. No sausage on hand? This dish is extremely versatile and works well with whatever protein you may have on hand such as shredded rotisserie chicken, leftover pork tenderloin or ground turkey. If you don’t have butternut squash you can easily sub it out for sweet potatoes. Instead of mozzarella, try Colby jack, crumbled feta or smoked mozzarella for added flavor. Whatever you do, don’t be afraid to make this dish your own by putting your own spin on it. That’s what makes cooking so enjoyable! 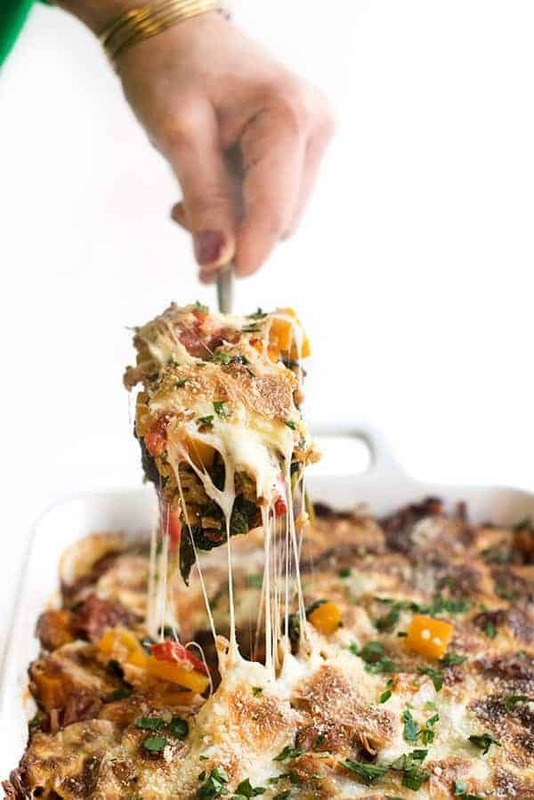 This hearty and comforting fall casserole is made with nutty farro, Italian sausage, creamy butternut squash and two types of mozzarella cheese. Pre-heat oven to 350 degrees and have a deep lasagna size baking dish ready. Cook farro according to package instructions and place cooked farro in a large bowl; set aside. Heat a deep skillet over medium-high heat. Remove sausage from casings and add to pan along with the garlic. Saute until golden brown and cooked through, about 7-9 minutes, stirring frequently. Using a slotted spoon, remove sausage from pan and place in the bowl with the reserved farro. Add the butternut squash cubes to the hot pan and sauté in the remaining fat rendered from the sausage. Sprinkle with salt and pepper to taste and sauté until squash becomes fork tender, about 4-5 minutes. Stir in spinach during the last minute of cook time. Remove from heat and place cooked squash and wilted spinach to the bowl with the farro and sausage. To the bowl with the farro mixture, stir in the fire roasted diced tomatoes, roasted red peppers and shredded mozzarella. Check for seasoning and add salt and pepper to taste. 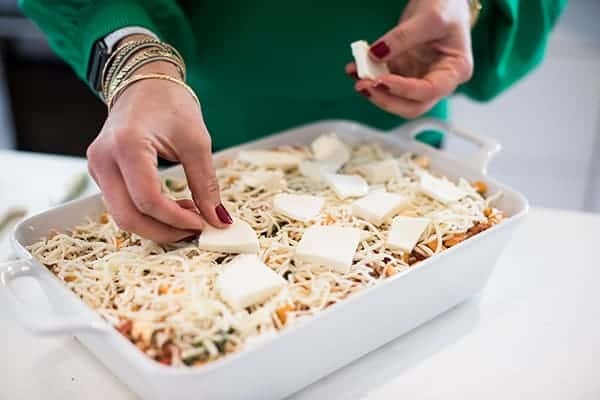 Spread mixture into the baking pan and top with fresh mozzarella slices. Bake until warm and cheese is golden brown and bubbly, about 45 minutes. Sprinkle with parmesan cheese to serve if you wish. This post is created with America’s Dairy Farm Families and Importers, in partnership with the Innovation Center for U.S. Dairy, however the views and opinions included are my own. Check out more healthy and easy dinner recipes on my Pinterest board! My kids dislike jarred roasted red peppers — too mushy I think. Would diced red pepper work? Would it need to be sauteed first? Yes – exactly! Just saute the first! Amazing is an understatement for this dish!! Thanks for sharing!!! I love that layer of melty cheese! Love the combination here – I have to try this! 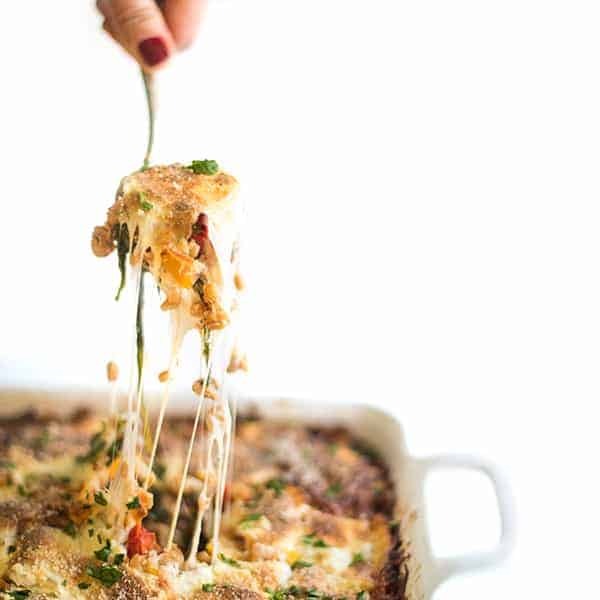 Oh, my gosh, I love everything about this casserole! The farro and double dose of mozzarella sold me!!! I want this for dinner!!! I’m all about this!! 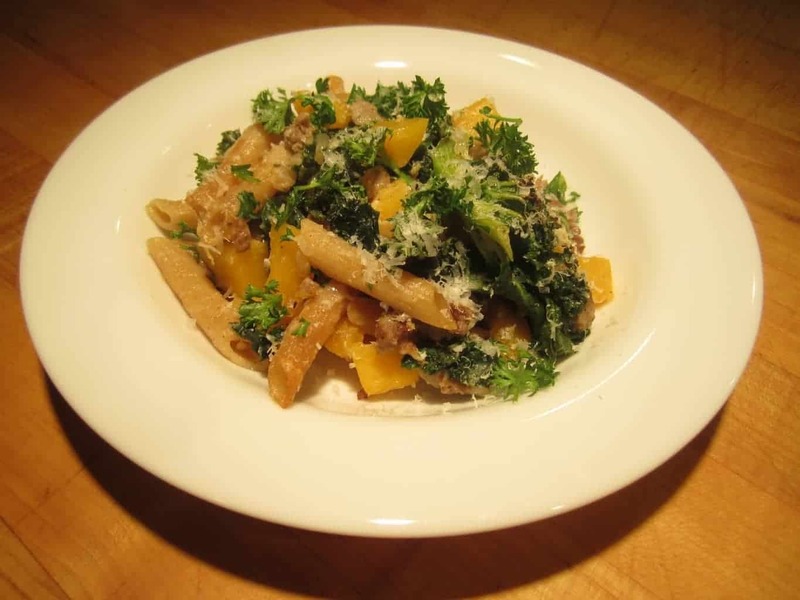 Farro and butternut squash and sausage?? Match made in heaven. Looks delicious Liz! Thank you friend!! Happy Holidays! ALL OF THAT CHEESE!!!! ???????????? Raul did an awesome job with that pulled cheese shot… It’s making me SO hungry!! Your food always looks amazing, Liz! Isn’t it great?? He’s the best!! Thanks so much Amy!! 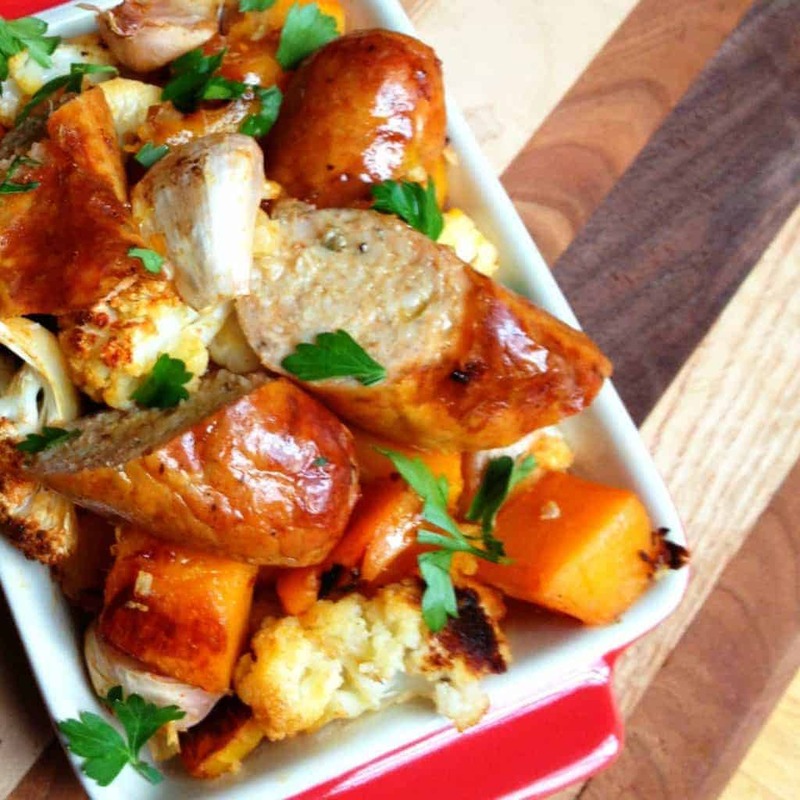 Sausage AND butternut squash in ONE?! Be still my beating heart. LOVE!